Sam Benz demonstrates the relatively small amount of equipment required for the newly automated voltage standard. The chip containing Josephson junctions is at the lower end of the rod. PML researchers are on the verge of reaching a long-sought major goal: Providing the world with a programmable quantum voltage standard that has an uncertainty of less than 1 part per billion, never needs calibration, and is sufficiently automated that it can be used in developing countries by non-experts. "Getting to this point has required three decades of extensive research and development in a host of fields, including materials science, microwave engineering, superconducting technology, and electronics and system integration," says Sam Benz, leader of the Quantum Voltage System Development and Dissemination project in the Quantum Electronics and Photonics Division. "And now, finally, we have also been able to incorporate a very high degree of automation as well. These new systems will empower a very wide range of researchers and businesses around the globe." Already, a very similar – if less user-friendly – version of NIST's programmable Josephson voltage standards (PJVS) have been installed in India, Brazil, and Taiwan; and China is interested in multiple units, says Dave Rudman, leader of PML's Quantum Devices Group. "The only problem with those is that they require an expert PhD physicist to operate," Rudman says. "We wanted a standard that was considerably easier to use. If dissemination of the new, automated system proceeds as envisioned, then within our lifetimes there will no longer be a need for voltage transfer standards that have to be shipped off periodically for re-calibration. We can make primary standards, programmable from 0 to 10 volts, which are simple and cheap enough that every lab can have one. This is real now." The extraordinary precision of the standard relies on a quantum-mechanical phenomenon characteristic of Josephson junctions*, which consist of two superconductors separated by a thin barrier through which pairs of electrons can tunnel. When the junction is biased with a current to generate a voltage across the junction, it will produce an alternating current at a frequency precisely determined only by the voltage. When microwaves are additionally applied to the junction, the junction oscillations lock to that frequency to produce voltage steps with magnitudes determined only by the microwave frequency. Because microwaves can be controlled to exquisite precision, so can the resulting voltage. The voltage "quantization" effect is independent of the environment or material composition of the microfabricated junctions. So the Josephson voltage standards (JVS) are truly intrinsic standards. "Every system based on these effects produces exactly the same voltage as every other system," Benz says. The integrated circuit for NIST's programmable AC/DC 10-volt standard. 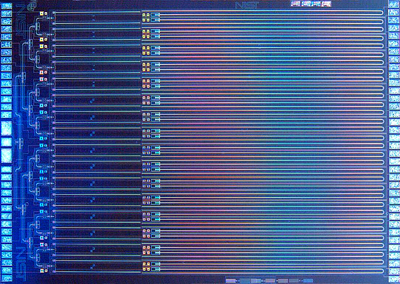 The chip contains about 300,000 superconducting Josephson junctions located along coplanar waveguides which run horizontally. The entire device is 12 mm by 17 mm. Traditionally, however, the devices have been extraordinarily challenging to make and use. Each individual junction, whose barrier thickness is on the order of 40 nanometers, produces no more than a few tens of microvolts; so arrays of hundreds of thousands of junctions are necessary to generate the voltages relevant to industry and electronics research. Each of those junctions has to be virtually identical and receive nearly the same microwave power; and they all must be addressed uniformly for the device to work. Not surprisingly, the evolution of the modern Josephson standard has moved through several stages as microfabrication techniques have improved, and scientists have explored different materials and configurations. In 1984, the first 1 V standard was produced, and by the late 1980s array technology was sufficiently advanced that 10 V superconducting integrated circuits had been successfully demonstrated, and JVS systems were at work in major national metrology institutes worldwide. "As a result," Benz says, "agreement of dc voltage measurements made in different labs improved by four orders of magnitude." Those measurements now differ by no more than a few parts in 1010. Of course, there was still much more to do. The earliest systems had been intended to allow precise realization of a single dc voltage. But science and industry needed a user-tunable system capable of realizing arbitrary ac and dc voltages. The first programmable JVS (PJVS) was devised at NIST in the early 1990s by physicist Clark Hamilton, with whom Benz was then working as a postdoctoral researcher. Benz soon became a staff scientist and with Hamilton pioneered numerous design innovations that continue today. Programmable designs require that the microwave signal be split into multiple channels via waveguides and that junctions must be divided into multiple subarrays, each of which can be addressed independently. In addition, each junction should be able to switch very fast, and produce accurate voltage steps over a well-defined range of bias current. (Josephson junctions produce both positive and negative voltages at discrete, quantized values.) Benz and colleagues introduced the first programmable 1 V system in 1997, and in 2006 announced a fully functional 10 V system. In 2008, NIST power meter calibrations were improved 20-fold when the NIST power and voltage teams developed a new measurement technique that exploited stepwise voltages synthesized by the PJVS. By 2010, the team had arrived at a state-of-the-art 10 V PJVS design for both dc and ac metrology. It contained 32 separate microwave channels addressing approximately 300,000 junctions made from niobium superconductors separated by niobium-doped silicon – a material combination that ensures fast, stable switching and low hysteresis. Enabling improvements to the microwave design included advanced superconducting microwave power dividers and filters that were developed by Mike Elsbury and Paul Dresselhaus. 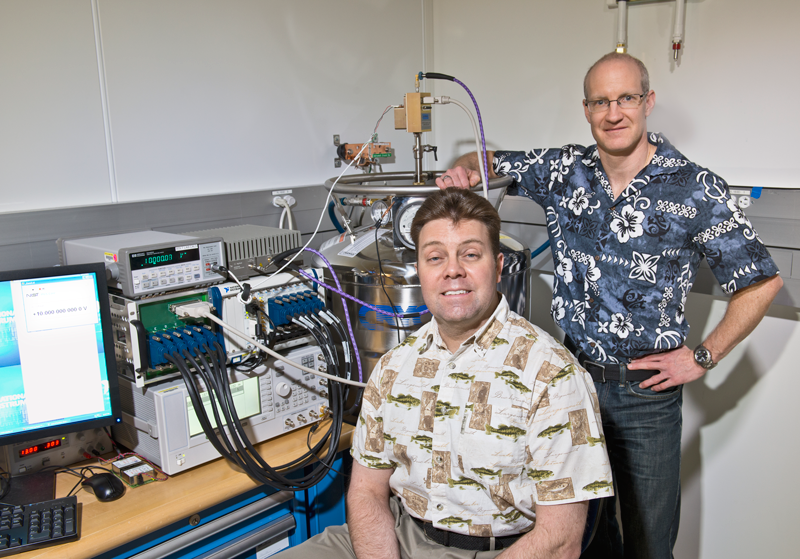 Charles Burroughs (front) and Alain Rüfenacht with the NIST 10V PJVS system. The monitor on left shows the measured voltage. The first system was shipped to NASA's Kennedy Space Center in Florida, and there was immediate and widespread demand: Dozens of standards labs, military organizations, and private companies worldwide need high-precision calibration of voltmeters for applications from consumer electronics to missile guidance systems. "But over the past three years," Benz says, "we've learned that many people who are using PJVS systems for these new applications neglect to ensure that their systems are performing with quantum accuracy. Even with sufficient training equipment, and software tools, additional measurements and extreme care are required to assure optimal performance. Many people do not appreciate that measurements which are both reproducible and of low uncertainty can still be inaccurate. "Even metrologists want a black box. So we realized that we've got to even further automate these systems to the point where the system continuously checks its quantum behavior and each application has a well-defined measurement circuit and automation software." For example, the PJVS requires perfect phase-lock synchronization between different inputs. "So we needed to somehow program a system that never lost phase lock for our pulse-driven JVS system," Benz says. "My colleague Steve Waltman found a way to do it in which all the inputs are intrinsically locked to each other because they're all generated with the same clock. It reduced the cost of the instrumentation by a factor of three while solving and simplifying the system integration." Some fixes required less sophisticated engineering or physics. "We get reports from people who have problems because they have poor local power supplies," Benz says. "We initially delivered our systems with separate components, and people were plugging them into different electrical outlets so the grounding was different. So now we've put everything into a single rack to optimize grounding and we include surge-suppressing power strips." Just when it appeared that the development phase for the new pulse-driven JVS design was completed, a further innovation turned up. "We were ready to push ahead with an eight-channel system pulse-driven JVS to reach 1V," Benz says, "but I was tuning up the system one day and set the power too high. I noticed that I still had quantum performance in this situation, which produces two Josephson pulses for every one input pulse. Basically, it's doubling the voltage, which means I can get rid of half the inputs. "We're still trying out different amplifiers to see which works best with this scheme. But now we really do have a chance to produce a practical turnkey pulse-driven system. We've been spending a lot of our time in the last year building that device and integrating it and getting ready to move it forward." It will be welcomed on arrival. "Right now, there are a lot of people clamoring for these things," Rudman says. "Through a computer interface, you tell the PJVS to generate any voltage you want from 0 to 10 volts, and it will put that out perfectly. And it can move between voltages fast enough so that you can for instance synthesize slow waveforms like 60 Hz at perfect tones." The whole system consists of the junction chip, mounted at the end of a rod for immersion in liquid helium, and a small rack of electronics. That might seem to be near-ultimate simplicity. But there is always a bit farther to go. "Access to liquid helium is a problem for some of the places these systems most need to go," Rudman says. "So we're already working on two different refrigeration schemes that will make the JVS systems even more like a black box." * The phenomenon was first predicted by Welsh physicist Brian Josephson in 1962 and confirmed shortly thereafter. Prior to that time, electrochemical cells were used as primary voltage standards. For a history of superconductivity in voltage metrology, see the NIST Online Museum of Voltage Standards.